Just as many of their space rock predecessors did a generation ago, Tame Impala makes a concerted effort to incorporate catchier elements on Lonerism. “Be Above It” is a forceful opener, with synths and vocals shimmering over the drum lead that submerges us into the deep end of the reverb pool. Two tempos, one sprightly and the other stately, duel on the mini-epic “Apocalypse Dreams.” The album truly shines when it revels in tawdry confections like “Mind Mischief,” featuring an unabashedly poppy guitar melody. “Feels Like We Only Go Backwards” is a stellar (or should we say interstellar?) ballad, cosmic organ and bluesy bass excellently complementing the relationship kiss-off lyrics. 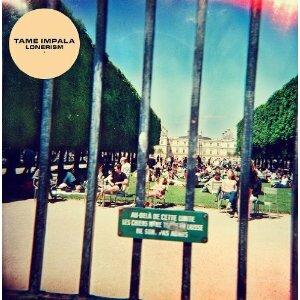 Despite its title, Lonerism’s overall tone is sunny and inviting, from the cocktail party chatter on “Keep On Lying” to the classic crunch of “Elephant.” The only criticism is that the distortion that accentuates the band’s aesthetic also makes comprehending lyrics difficult. The two most common follow-up album pitfalls are as follows: either it sounds too much like a remake of the previous release, or it is so markedly dissimilar that it alienates the fan base. With Lonerism, Tame Impala avoids both snares and produces Innerspeaker’s arguably more accessible companion.